Today’s image is special for me – it represents a big first! This is the first time I’ve captured wildlife up close with this camera. Dad and I were headed to the Base Exchange on Warren Air Force Base this afternoon. 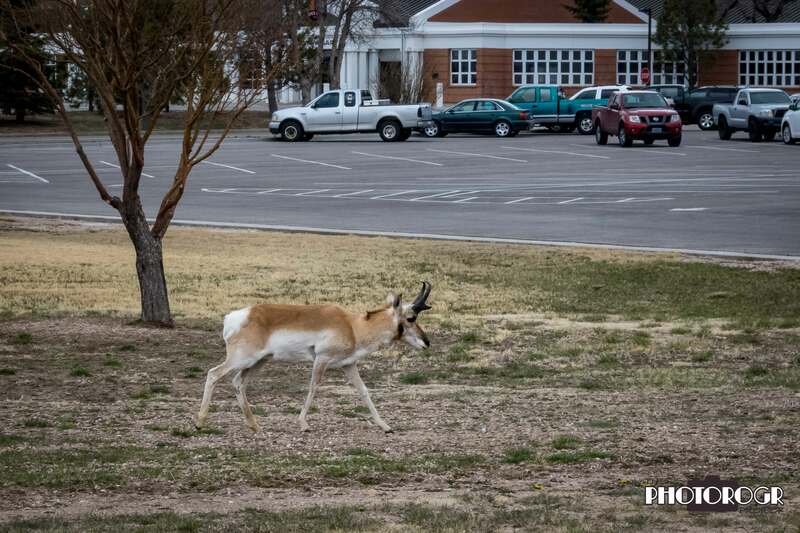 Warren is famous for its large Pronghorn herds that roam freely around the base. We drove by several that were close to the road. We weren’t able to stop until we pulled into the BX and found this Buck standing near the road – close enough to shoot with my PowerShot! Male Pronghorns have distinctive black markings on the face, neck, and below their ears. Their horns are shaped like a lyre when viewed from the front. Females also have horns, but they are smaller and generally straight with a slight curve (or prong shape) at the top. They almost look like a goat and a deer cross. Cool pic! Very cool Roger. I’ve never seen a pronghorn before.